We hope you are enjoying our new website so far. Here, we now have the ability to house our delicious recipes, share our own food experiences, and most importantly, give you all the latest news & updates about Culinary Kids Academy! That being said: this Sunday at 3 p.m., please join us for our CKA Friends Community's Jewish Teen Inclusion Workshop at Temple Emanuel of Beverly Hills. If you are interested, please register here. Can't attend this Sunday? No problem! We have four additional programs in this inclusion series throughout the next few months. Click here to enroll. With Summer quickly approaching, so is camp season! 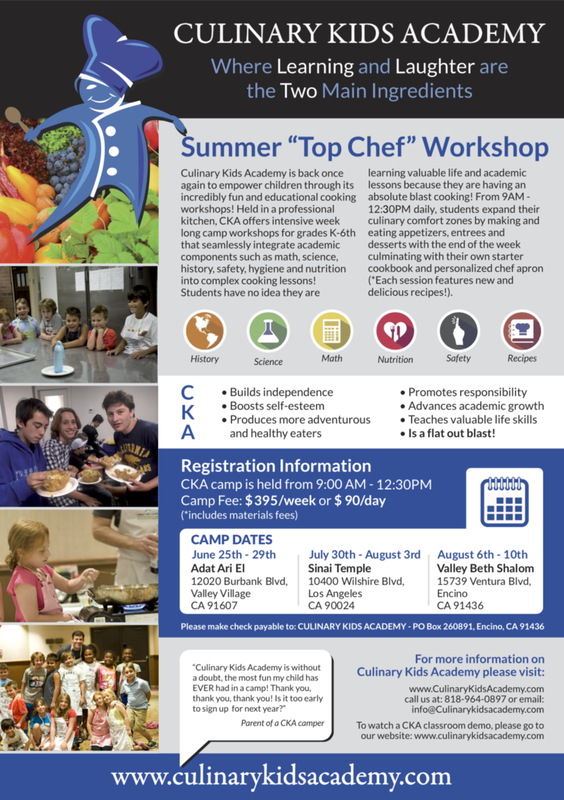 CKA is hosting three separate week-long cooking camps. Click here to join in on the fun! Lastly, we are continuing our partnership with Valley Beth Shalom's "Camp KEF." To register for CKA at Camp KEF, please click here. Below are the three flyers with more information.